It is possible to straighten your smile discreetly with invisible braces. Clear Correct invisible braces are an exciting alternative to traditional braces. Instead of the hard brackets and wires associated with traditional types of braces, Clear Correct invisible braces are actually made from soft aligner trays that fit over the top and bottom rows of teeth. There are no hard brackets or wires to potentially irritate the mouth. Dr. Colin Osborne is your Lumberton dentist for invisible braces. Invisible braces are a new method for straightening the teeth. Invisible braces are formally known as Clear Correct and, as the name implies, are clear so they are practically invisible to others. Clear Correct invisible braces straighten the teeth with aligner trays instead of brackets and wires, like other types of braces. There are separate trays for the top and bottom rows of teeth. The trays are custom made specifically for your teeth based on x-rays, photos, and impressions of your teeth. The custom trays are replaced with new trays every few weeks. Each new set of aligner trays gently moves the teeth closer to their final position. Your Lumberton dentist can help you decide if Clear Correct invisible braces are the right choice for straightening your smile. There are several advantages to selecting invisible braces as your preferred method for straightening your teeth. A primary advantage of invisible braces is that the aligner trays are clear so they are barely noticeable to others, if at all. Another advantage is the the trays are made from a soft plastic material that is comfortable to wear and will not poke or irritate the mouth in the same way the brackets and wires associated with other types of braces can. An additional advantage of invisible braces is that the trays are removable. The trays can be taken out to eat and drink to avoid food particles getting trapped in the trays. The trays can also be removed to brush and floss, which makes it easier to thoroughly clean the teeth. In general, maintaining good oral hygiene tends to be easier with invisible braces versus other types of non-removable braces. Invisible braces are the discreet method for straightening your smile. To learn more about invisible braces and whether they are right for you, schedule an appointment with Dr. Osborne, your Lumberton, NC, dentist, by calling the office at (910) 738-9396. We’ve come a long way in our ability to restore missing teeth. Today’s top choice is dental implants, prized not only for their close resemblance to real teeth but also their durability. The rise of implants, though, hasn’t put older restorative methods out to pasture—many continue to offer patients a viable and affordable choice for tooth replacement. 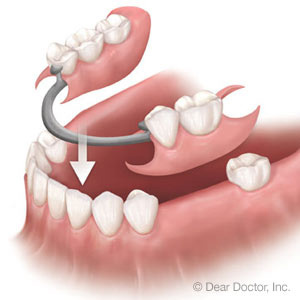 One example is the removable partial denture (RPD). Once quite common, RPDs’ popularity has only slightly diminished with the advent of implants. They’re a fair option in terms of dental function and appearance, and much less expensive than implants or fixed bridges. Similar to a full denture—a removable appliance that replaces all the teeth on a dental arch—a RPD can replace multiple missing teeth in a variety of configurations. A traditional RPD is usually constructed of vitallium, a lightweight but strong metal alloy, which allows for a very thin and comfortable frame. It’s covered in a gum-colored resin or plastic with prosthetic (false) teeth precisely set at the missing teeth’s locations. The appliance stays in place through a series of clasps that attach to the remaining teeth. Each RPD is custom-made to fit a patient’s mouth contours and the locations and patterns of the missing teeth. The top design goal for each individual RPD is to minimize any rocking movement during chewing; achieving that goal will depend not only on how many teeth are missing and where, but also what type of teeth are being replaced. For example, teeth missing from the back would require a different support design than teeth missing from the side or front. RPDs’ biggest benefits are comfortable fit, effective dental function and good appearance. However, their means of attachment can create difficulties keeping remaining teeth clean of disease-causing bacterial plaque. Furthermore, an ill-fitting or unstable RPD could damage or even loosen natural teeth. It’s therefore essential for wearers to diligently practice daily hygiene (including cleaning the RPD) and undergo regular fit monitoring with their dentist. Even with these constraints, a RPD can do an acceptable job providing dental function. What’s more, it can definitely improve your smile. Root canal therapy--many people receive it, bringing diseased teeth back to full health. A great alternative to dental extraction, a root canal spares hard outer structure of a tooth, while removing unhealthy pulp in its interior. Your dentist in Lumberton, NC, Dr. Colin Osborne, III, performs this effective restoration right in his office. Do you need a root canal? After careful examination and X-ray imaging of an infected, cracked, or extensively decayed tooth, your Lumberton dentist can tell if it would benefit from root canal therapy. Also called endodontic therapy, a root canal procedure takes two, or sometimes three, dental visits and usually needs only locally-injected medication to numb the tooth. The end result is a strong, fully functional tooth. To start, Dr. Osborne creates an access hole into the first of up to four root canals, the interior chambers which run from the crown of the tooth into each of the roots. The canals contain blood vessels, nerves, and connective tissue, and while important to the tooth during its development, an adult tooth can perform without these tissues. Dr. Osborne uses small metal files to remove the pulp. He smooths the canal walls and instills antibiotics to quell infection. An inert putty called gutta-percha seals the canal and also strengthens the overall tooth structure. A temporary filling or crown normalizes the tooth's appearance as it heals. After a week or so, you return to the office and your dentist removes the temporary restoration and places a permanent, customized crown. The crown covers the tooth from the top to the gum line. Do you need a root canal treatment? Brush twice a day (the American Dental Association advises a soft brush and fluoride toothpaste). Floss daily to remove plaque. Eat a nutritious diet and stay hydrated. See your dentist twice a year for exams and professional cleanings. With your diligent home hygiene habits, combined with in-office care, your restored tooth should last for years or even the rest of your life. If you're worried about the health of a tooth, don't delay. Contact Dr. Osborne today for a consultation in Lumberton, NC: (910) 738-9396. We look forward to helping you achieve your best possible oral health. Probably a day doesn’t go by that you don’t encounter advertising for dental implants. And for good reason: implants have taken the world of dentistry by storm. Since their inception over thirty years ago, implants have rocketed ahead of more conventional tooth replacements to become the premier choice among both dentists and patients. But what is an implant—and why are these state-of-the-art dental devices so popular? Resemblance to natural teeth. 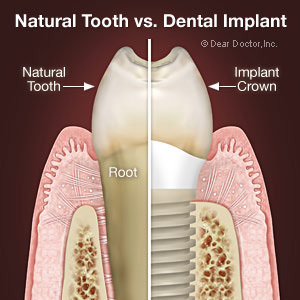 More than any other type of dental restoration, dental implants mimic both the appearance and function of natural teeth. Just as teeth have two main parts—the roots beneath the gum surface and the visible crown—so implants have a similar construction. At their heart, implants are root replacements by way of a titanium metal post imbedded in the jawbone. To this we can permanently attach a life-like porcelain crown or even another form of restoration (more about that in a moment). Durability. Implant materials and unique design foster a long-term success rate after ten years in the 95-plus percentile. They achieve this longevity primarily due to the use of titanium as the primary metal in the implant post. Because bone has an affinity for titanium, it will grow and adhere to the post over time to create a well-anchored hold. With proper maintenance and care implants can last for decades, making them a wise, cost-effective investment. Added stability for other restorations. While most people associate implants with single tooth replacements, the technology has a much broader reach. For example, just a few strategically-placed implants can support a removable denture, giving this traditional restoration much more security and stability. What’s more, it can help stop bone loss, one of the main drawbacks of conventional dentures. In like fashion, implants can support a fixed bridge, eliminating the need to permanently alter adjacent teeth often used to support a conventional bridge. With continuing advances, implant technology is becoming increasingly useful for a variety of restorative situations. Depending on your individual tooth-loss situation, dental implants could put the form and function back in your smile for many years to come.